This document explains how to install and run Red Hat Decision Manager 7.0 on Red Hat JBoss Enterprise Application Platform 7.1 and Red Hat JBoss Web Server with Tomcat 8. Red Hat Decision Manager is an open source decision management platform that combines business rules management and complex event processing. It includes decision management and business resource optimization capabilities. With Red Hat Decision Manager, you can automate business decisions and make that logic available to the entire business. Red Hat Decision Manager uses a centralized repository for storing all resources. This ensures consistency, transparency, and the ability to audit across the business. Business users can modify business logic and business processes without requiring assistance from IT personnel. Before you begin installing Red Hat Decision Manager, there are many options that you should consider. Review the information in this chapter for an overview of the installation options and components that work with Red Hat Decision Manager. Red Hat Decision Manager is made up of Decision Central, Decision Server, and Red Hat Business Optimizer. Decision Central is the graphical user interface where you create and manage business rules. Decision Server is the server where the rules and other artifacts are stored. Decision Server is used to instantiate and execute rules and solve planning problems. Red Hat Business Optimizer is a lightweight, embeddable planning engine that optimizes planning problems. For information about installing Decision Server on IBM WebSphere Application Server, see Installing and configuring Decision Server on IBM WebSphere Application Server. For information about installing Decision Server on Oracle Weblogic Server, see Installing and configuring Decision Server on Oracle WebLogic Server. For information about installing Red Hat Business Optimizer, see Installing and configuring Red Hat Business Optimizer. Download and run the executable JAR installer for installation on Red Hat JBoss EAP 7.1 or Red Hat JBoss Web Server 3.1 with Tomcat 8. The installer graphical user interface steps you through the installation process. Download one of the following ZIP file installations. The ZIP file installation does not require a graphical user interface so you can install Red Hat Decision Manager using SSH. To install Decision Server on Red Hat JBoss Web Server 3.1 with Tomcat 8, download the rhdm-7.0-kie-server-jws.zip file. For more information, see Red Hat Decision Manager 7 Supported Configurations. For installation instructions, see Chapter 2, Installing Red Hat Decision Manager. admin: Users with the admin role are the administrators of Red Hat Decision Manager. Administrators can manage users, manage, create, and clone the repositories, and have full access to make the required changes in the application. Users with the admin role have access to all areas within the system. Before you can use Decision Central, you must create a user that has the admin role. analyst: Users with the analyst role have access to all high-level features to model projects. However, Authoring → Administration access is unavailable to these users. Certain lower-level features intended for developers, such as the Deployment → Artifact Repository view are not available to this role. However, the Build & Deploy button is available to users with the analyst role while they are using the Project Editor. kie-server: Users with the kie-server role can access Decision Server (KIE Server) REST capabilities. To log in to Decision Server, you must create a user that has the kie-server role. For more information, see Section 2.3.3, “Creating users”. The asset repository, Apache Maven, Red Hat JBoss Developer Studio, and Red Hat Business Optimizer each perform an important function by integrating with Red Hat Decision Manager. Business rules and other assets and resources created in Decision Central are stored in the asset repository, which is otherwise known as the knowledge store. The knowledge store is a centralized repository for your business knowledge. The knowledge store connects to the Git repository to store various knowledge assets and artifacts at a single location. Decision Central provides a web front-end that enables you to view and update the stored content. You can access the content by using the Project Explorer from the unified environment of Red Hat Decision Manager. All business assets are stored in repositories. See Section 3.1, “Using the Maven repository in your project” for instructions on configuring Apache Maven. For more information about Red Hat JBoss Developer Studio, see Section 3.3, “Installing and setting up Red Hat JBoss Developer Studio”. Red Hat Business Optimizer is a lightweight, embeddable planning engine that optimizes planning problems. It helps Java programmers solve planning problems efficiently, and it combines optimization heuristics and metaheuristics with efficient score calculations. Employee/Patient Rosters: It helps create timetables for nurses and keeps track of patient bed management. Educational Timetables: It helps schedule lessons, courses, exams, and conference presentations. Shop Schedules: It tracks car assembly lines, machine queue planning, and workforce task planning. Cutting Stock: It minimizes waste by reducing the consumption of resources such as paper and steel. Every organization faces planning problems. They provide products and services with a limited set of constrained resources (employees, assets, time, and money). Red Hat Business Optimizer helps Java programmers solve constraint satisfaction problems efficiently. It combines optimization heuristics and metaheuristics with efficient score calculation. For more information, see Installing and configuring Red Hat Business Optimizer. High availability describes a system or component that is continuously operational, or available, for a desirably long length of time. You can measure availability relative to the unattainable value of 100% available, or never failing. A common but difficult-to-achieve standard of availability for a system or product is known as "five 9s" (99.999 percent) availability. High-availability (HA) clusters are groups of services that can be used with a minimum or no down-time. Without clustering, if a service crashes or is too busy, the user asking for that service will not get a quick response. With high availability clustering, mulitple nodes provide copies of data and services. A service watchdog detects a failure on one node of the cluster, restarts the failed node, and simultaneously switches service to another node. In most cases the failure is not visible or noticeable to the user. See Chapter 4, Clustering with Red Hat Decision Manager for design-time development environments for information on how to set up a high availability cluster with Red Hat Decision Manager. Red Hat JBoss Enterprise Application Platform (Red Hat JBoss EAP) 7.1 is a certified implementation of the Java Enterprise Edition 7 (Java EE 7) full and web profile specifications. Red Hat JBoss EAP provides preconfigured options for features such as high availability, clustering, messaging, and distributed caching. It also enables users to write, deploy, and run applications using the various APIs and services that Red Hat JBoss EAP provides. Red Hat JBoss Web Server is an enterprise ready web server designed for medium and large applications, based on Tomcat 8. Red Hat JBoss Web Server provides organizations with a single deployment platform for Java Server Pages (JSP) and Java Servlet technologies, PHP, and CGI. Red Hat Decision Manager consists of Decision Central and Decision Server. You can install Decision Central on a Red Hat JBoss EAP 7.1 server installation. You can install Decision Server on a Red Hat JBoss EAP 7.1 or Red Hat JBoss Web Server installation. Installing and configuring Decision Server on IBM WebSphere Application Server. Installing and configuring Decision Server on Oracle WebLogic Server. The instructions in this document explain how to install Red Hat Decision Manager on Red Hat JBoss EAP 7.1 and Red Hat JBoss Web Server 3.1 on premise. For information about installing on the Red Hat OpenShift Container Platform, see Deploying Red Hat Decision Manager on Red Hat OpenShift Container Platform. What is the mapping between RHDM product and maven library version? This section describes installing Decision Central and Decision Server on the same server. Red Hat recommends installing Decision Central and Decision Server on different servers in production environments. Depending on your environment and installation requirements, download a Red Hat Decision Manager distribution. On the Product Downloads page that opens, navigate to the JBOSS INTEGRATION AND AUTOMATION section, and click Red Hat Decision Manager. On the Software Downloads page, if necessary select BRMS from the Product menuand 7.0 from the Version menu. To use the installer to install Red Hat Decision Manager on Red Hat JBoss EAP 7.1 or Decision Server on Red Hat JBoss Web Server 3.1, download Red Hat Decision Manager 7.0.0 Installer (rhdm-installer-7.0.0.GA.jar). This section describes the steps required to install Red Hat Decision Manager using the installer JAR file. The JAR file is an executable file that installs Red Hat Decision Manager in an existing Red Hat JBoss EAP 7.1 or Red Hat JBoss Web Server 3.1 with Tomcat 8 server installation. You can run the installer in standard or command line interface (CLI) mode. The Red Hat Decision Manager JAR file installer does not support the Red Hat JBoss EAP distribution installed by yum or RPM Package Manager. If you want to install Red Hat Decision Manager in this type of Red Hat JBoss EAP installation, download the Red Hat Decision Manager 7.0 Deployable for Red Hat JBoss EAP 7.1 file and follow the steps described in Section 2.3, “ZIP file installation for Red Hat Decision Manager on Red Hat JBoss EAP”. Because IBM JDK cannot use keystores generated on other JDKs, it is not possible to install Red Hat Decision Manager into an existing Red Hat JBoss EAP installation running on IBM JDK with a keystore generated on another JDK. The installer for Red Hat Decision Manager is an executable JAR file. You can use it to install Red Hat Decision Manager in an existing Red Hat JBoss EAP 7.1 or Red Hat JBoss Server 3.1 with Tomcat 8 server installation. For security reasons, you should run the installer as a non-root user. If you are installing Decision Server on Red Hat JBoss Web Server 3.1, ensure that you are logged in with a user that has write permission for Tomcat 8. The JAR binary inlcuded in $PATH environment variable. On Red Hat Enterprise Linux, it is included in the java-$JAVA_VERSION-openjdk-devel package. Red Hat Decision Manager is designed to work with UTF-8 encoding. If a different encoding system is used by the underlying JVM, unexpected errors might occur. To ensure UTF-8 is used by the JVM, use the "-Dfile.encoding=UTF-8" system property. The graphical installer displays a splash screen and a license agreement page. Click I accept the terms of this license agreement and click Next. Specify the Red Hat JBoss EAP 7.1 or Red Hat JBoss 3.1 Web Server with Tomcat 8 server home where you want to install Red Hat Decision Manager and click Next. Select the components that you want to install and click Next. You cannot install Decision Central on Red Hat JBoss 3.1 Web Server with Tomcat 8. You can only install it on Red Hat JBoss EAP. However, you can install the Decision Central controller on Red Hat JBoss 3.1 Web Server with Tomcat 8. The controller is used to manage Decision Server. Install it if you plan to manage multiple Decision Server instances. It is possible to install Decision Central and Decision Server on the same server. However, Red Hat recommends installing Decision Central and Decision Server on different servers in production environments. To do this, run the installer twice. Create the Decision Manager admin user and click Next. Make sure that the selected user name is not the same as an existing user, role, or group. For example, do not create a user with the user name admin. Make a note of the user name and password. You will need them to access Decision Central and Decision Server. On the Component Installation page, click Next to start the installation. The Component Installation page lists the components that you will install. When the installation has completed, click Next on the Processing Finished page. On the next page,you will see the message Installation has completed successfully. You have successfully installed Red Hat Decision Manager using the installer. On Red Hat JBoss EAP, if you installed only Decision Central, repeat these steps to install Decision Server on a separate server. You can run the installer for Red Hat Decision Manager through the command-line interface (CLI). The command-line interactive process will start and display the End-User License Agreement. Enter the parent directory of an existing Red Hat JBoss EAP 7.1 or Red Hat JBoss Web Server 3.1 with Tomcat 8 installation. The installer will verify the location of the installation at the location provided. Enter 1 to confirm and continue. It is possible to install Decision Manager and Decision Server on the same server. However, Red Hat recommends installing Decision Central and Decision Server on different servers in production environments. When you create the user name and password, make sure that the specified user name does not conflict with any known title of a role or a group. For example, if there is a role called admin, you should not create a user with the user name admin. The password must have at least eight characters and must contain at least one number and one non-alphanumeric character (not including the character &). Would you like to generate an automatic installation script and properties file? Enter y to create an XML file that contains the installation data, or n to complete the installation. If you enter y, you are prompted to specify a path for the XML file. Enter a path or press the Enter key to accept the suggested path. You have successfully installed Red Hat Decision Manager. If you installed only Decision Central, repeat these steps to install Decision Server on a separate server. The deployable ZIP file installation of Red Hat Decision Manager 7.0 on Red Hat JBoss EAP consists of two ZIP files, one for Decision Central and one for Decision Server. In a production environment, you should install Decision Central and Decision Server on separate servers. Create, manage, and edit your rules and related assets. Manage connected Decision Servers and their containers. Extract the rhdm-7.0.0.GA-decision-central-eap7-deployable.zip file to a temporary directory. In the following examples this directory is called TEMP_DIR. Copy the contents of the TEMP_DIR/rhdm-7.0.0.GA-decision-central-eap7-deployable/jboss-eap-7.1 directory to EAP_HOME. When asked to overwrite files or merge directories, select Yes. A backed up Red Hat JBoss EAP installation, version 7.1 or higher. The base directory of the Red Hat JBoss EAP installation is referred to as EAP_HOME. Sufficient user permissions to complete the installation. Extract the rhdm-7.0.0.GA-kie-server-ee7.zip archive to a temporary directory. In the following examples, this directory is called TEMP_DIR. Copy the TEMP_DIR/rhdm-7.0.0.GA-kie-server-ee7/rhdm-7.0.0.GA-kie-server-ee7/kie-server.war directory to EAP_HOME/standalone/deployments/. Copy the contents of the TEMP_DIR/rhdm-7.0.0.GA-kie-server-ee7/rhdm-7.0.0.GA-kie-server-ee7/SecurityPolicy/ to EAP_HOME/bin. When asked to overwrite files, select Yes. Before you can use Decision Central, you must create a user that has the admin role. To log in to Decision Server, you must create a user that has the kie-server role. You can create a single user that has both of these roles. Create a user that you will use to log in to Decision Central and Decision Server. In the following command, replace <username> and <password> with the user name and password of your choice. Make a note of your user name and password. If Decision Server will be managed by Decision Central, you must edit the standalone.xml file in both the Decision Server and Decision Central installations, as described in this section. Only make these changes if Decision Server will be managed by Decision Central. Red Hat recommends that you install Decision Server and Decision Central on different servers in production environments. However, if you install Decision Server and Decision Central on the same server, for example in a development environment, make these changes in the shared standalone.xml file. In the Decision Server EAP_HOME/standalone/configuration/standalone.xml file, uncomment the following properties in the <system-properties> section. Replace <KIE_SERVER_ID> with the ID or name of the Decision Server installation, for example, rhdm700-decision-server-1. Replace <DECISION_CENTRAL_URL> with the URL of Decision Central. Decision Server connects to this URL during startup. After you have installed Red Hat Decision Manager on Red Hat JBoss EAP, use this procedure to run the Red Hat Decision Manager in standalone mode. Red Hat Decision Manager installed in EAP_HOME as described in Section 2.3, “ZIP file installation for Red Hat Decision Manager on Red Hat JBoss EAP”. Red Hat Decision Manager configured as described in Section 2.3.4, “Configuring Decision Server”. In a terminal application, navigate to EAP_HOME/bin. If you deployed Decision Server without Decision Central on Red Hat JBoss EAP then you must use one of the following commands to start Red Hat JBoss EAP with the standalone-full profile. In a web browser, open the URL localhost:8080/decision-central. Log in using the user name rhdmAdmin and the password password@1. Decision Server provides the runtime environment for business assets and accesses the data stored in the assets repository (knowledge store). This section explains how to perform the ZIP file installation to install Decision Server on an existing Red Hat JBoss Web Server 3.1 instance. To use the installer JAR file to install Decision Server, see Section 2.2, “Using the installer to install Red Hat Decision Manager on Red Hat JBoss EAP or Red Hat JBoss Web Server”. A backed up Red Hat JBoss Web Server 3.1 with Tomcat 8 or higher server installation. The base directory of the JBoss Web Server installation is referred to as JWS_HOME. Click Download next to Red Hat Decision Manager 7.0.0 Add Ons on the Product Downloads page of the Red Hat Customer Portal. Unzip the rhdm-7.0.0.GA-add-ons.zip file. The rhdm-7.0-kie-server-jws.zip file is in the unzipped directory. Extract the rhdm-7.0-kie-server-jws.zip archive to a temporary directory. In the following examples, this directory is called TEMP_DIR. Copy the TEMP_DIR/rhdm-7.0-kie-server-jws/kie-server.war directory to the JWS_HOME/tomcat8/webapps directory. Ensure the names of the Red Hat Decision Manager deployments you are copying do not conflict with your existing deployments in the Red Hat JBoss Web Server instance. Remove the .war extensions from the kie-server.war folder. Open the JWS_HOME/tomcat8/conf/tomcat-users.xml file in a text editor. set "CATALINA_OPTS=-Xmx1024m -Dorg.jbpm.server.ext.disabled=true -Dorg.jbpm.ui.server.ext.disabled=true -Dorg.jbpm.case.server.ext.disabled=true"
After a few minutes, review the the JWS_HOME/tomcat8/logs directory and correct any errors. In this command, replace <CONTROLLER> and <CONTROLLER_PWD> with the values in the tomcat-users.xml file. The output of this command provides information about the Decision Server instance. Red Hat supports this installation type only when it is installed on premise, on Red Hat Enterprise Linux. Download the Decision Central standalone JAR file from the Red Hat Customer Portal. In a terminal window, navigate to the directory where you downloaded the installer file. For more information, see Section 1.3, “User roles”. See Section 2.5.1, “Supported properties” for more information. org.uberfire.nio.git.ssh.passphrase: Pass phrase to access the public key store of your operating system when cloning git repositories with SCP style URLs. Example: git@github.com:user/repository.git. org.uberfire.ldap.regex.role_mapper: Regex pattern used to map LDAP principal names to application role name. Note that the variable role must be part of the pattern as it is substited by the application role name when matching a principal value to role name. Default: Not used. org.kie.server.controller: URL for connecting with a Kie Server Controller, for example: ws://localhost:8080/decision-central/websocket/controller. org.kie.example: Enables external clone of a demo application from GitHub. org.kie.server.user: User name used to connect with the Decision Server nodes from the controller. This property is only required when using this Decision Central installation as a controller. org.kie.server.pwd: Password used to connect with the Decision Server nodes from the controller. This property is only required when using this Decision Central installation as a controller. You can configure Decision Server to run in managed or unmanaged mode. If Decision Server is unmanaged, you must manually create and maintain containers. If Decision Server is managed, the standalone Decision Server Controller manages the Decision Server configuration and you interact with the Controller to create and maintain containers. The standalone Decision Server Controller is integrated with Decision Central. If you install Decision Central, use the Exection Server page to create and maintain containers. However, if you do not install Decision Central, you can install the standalone Decision Server Controller and use the REST API or the Decision Server Java Client API to interact with it. You can install the standalone Decision Server Controller and use the REST API or the Decision Server Java Client API to interact with it. Download the rhdm-7.0-controller-ee7.zip file by clicking Download next to Red Hat Decision Manager 7.0.0 Add Ons on the Product Downloads page of the Red Hat Customer Portal. Unzip the rhdm-7.0.0.GA-add-ons.zip file. The rhdm-7.0-controller-ee7.zip file is in the unzipped directory. Extract the rhdm-7.0-controller-ee7 archive to a temporary directory. In the following examples, this directory is called TEMP_DIR. Copy the TEMP_DIR/rhdm-7.0-controller-ee7/controller.war directory to EAP_HOME/standalone/deployments/. Ensure the names of the standalone Decision Server Controller deployments you are copying do not conflict with your existing deployments in the Red Hat JBoss EAP instance. Copy the contents of the TEMP_DIR/rhdm-7.0-controller-ee7/SecurityPolicy/ directory to EAP_HOME/bin. When asked to overwrite files, select Yes. In the EAP_HOME/standalone/deployments/ directory, create an empty file named controller.war.dodeploy. This file ensures that the standalone Decision Server Controller is automatically deployed when the server starts. Before you can use the standalone Decision Server Controller, you must create a user that has the kie-server role. The controller installed in an EAP_HOME home. Enter the following command and replace <USER_NAME> and <PASSWORD> with the user name and password of your choice. If Decision Server will be managed by the standalone Decision Server Controller, you must edit the standalone.xml file in both the Decision Server and standalone Decision Server Controller installations, as described in this section. Red Hat recommends that you install Decision Server and the standalone Decision Server Controller on different servers in production environments. However, if you install Decision Server and the standalone Decision Server Controller on the same server, for example in a development environment, make these changes in the shared standalone.xml file. Replace <CONTROLLER_USER> and <CONTROLLER_PWD> with the credentials of a user with the kie-server role. After you have installed the standalone Decision Server Controller on Red Hat JBoss EAP, use this procedure to run the standalone Decision Server Controller. To verify that the Controller is working on Red Hat JBoss EAP, enter the following command where <CONTROLLER> and <CONTROLLER_PWD> is the user name and password combination that you created in Section 2.6.1.1, “Creating users”. The output of this command provides information about the Decision Server instance. Alternatively, you can use the Decision Server Java API Client to access the standalone Decision Server Controller. Unzip the rhdm-7.0.0.GA-add-ons.zip file. The rhdm-7.0-controller-jws.zip file is in the unzipped directory. Extract the rhdm-7.0-controller-jws.zip archive to a temporary directory. In the following examples, this directory is called TEMP_DIR. Copy the TEMP_DIR/rhdm-7.0-controller-jws.zip/controller.war directory to the JWS_HOME/tomcat8/webapps directory. Remove the .war extensions from the controller.war folder. Copy the contents of the TEMP_DIR/rhdm-7.0-controller-jws/SecurityPolicy/ directory to JWS_HOME/bin. When asked to overwrite files, select Yes. In the JWS_HOME/standalone/deployments/ directory, create an empty file named controller.war.dodeploy. This file ensures that the standalone Decision Server Controller is automatically deployed when the server starts. CATALINA_OPTS="-Xmx1024m -Dorg.jbpm.server.ext.disabled=true -Dorg.jbpm.ui.server.ext.disabled=true -Dorg.jbpm.case.server.ext.disabled=true -Dorg.kie.server.controller.user=<CONTROLLER_USER> -Dorg.kie.server.controller.pwd=<CONTROLLER_PWD> -Dorg.kie.server.id=<KIE_SERVER_ID> -Dorg.kie.server.location=http://<HOST>:<PORT>/kie-server/services/rest/server -Dorg.kie.server.controller=http://<HOST>:<PORT>/controller/rest/controller"
To verify that the Controller is working on Red Hat JBoss Web Server, enter the following command. In this command, replace <CONTROLLER> and <CONTROLLER_PWD> with the values in the tomcat-users.xml file. The output of this command provides information about the Decision Server instance. Configure the Project Object Model (POM) file (pom.xml). Modify the Maven settings.xml file. This file is included with Maven repository available for download from the Red Hat Customer Portal. Red Hat recommends directing Maven to use the Red Hat Decision Manager Maven repository across all projects by using the Maven global or user settings. To use Maven for building and managing your Red Hat Decision Manager projects, you must configure your projects to be built with Maven. Maven requires the POM file (pom.xml) that holds configuration details for your project. For more information, see Apache Maven Project. Generate a Maven project. A pom.xml file is automatically generated when you create a Maven project. Edit pom.xml to add more dependencies and new repositories. Maven downloads all of the JAR files and the dependent JAR files from the Maven repository when you compile and package your project. Find the schema for the pom.xml file at http://maven.apache.org/maven-v4_0_0.xsd. For more information about POM files, see Apache Maven Project POM. In the Maven install directory at $M2_HOME/conf/settings.xml. These settings are called global settings. In the user’s install directory at $USER_HOME/.m2/settings.xml. These settings are called user settings. A custom location specified by the system property kie.maven.settings.custom. The settings used is a merge of the files located in these locations. For more information, see Apache Maven Project. To use the correct Maven dependencies in your Red Hat Decision Manager project, you must add relevant bill of materials (BOM) files to the project’s pom.xml file. When you add the BOM files, the correct versions of transitive dependencies from the provided Maven repositories are included in the project. For information, see What is the mapping between RHDM product and maven library version? Declare dependencies needed for your project in the <dependencies> tag. Git is a distributed version control system. It implements revisions as commit objects. When you commit your changes into a repository, a new commit object in the Git repository is created. When you create a project in Decision Central it is added to the Git repository connected to Decision Central. If you have projects in other Git repositories, you can import them into Decision Central spaces. Select or create the space into which you want to import the projects. The default space is myteam. Click the three verticle dots on the right side of the screen and select Import Project. In the Import Project window, enter the URL and credentials for the Git repository that contains the projects that you want to import and click Import. The projects are added to the current space. Red Hat JBoss Developer Studio is the JBoss Integrated Development Environment (IDE) based on Eclipse. Red Hat JBoss Developer Studio provides plug-ins with tools and interfaces for Red Hat Decision Manager. Download the latest Red Hat JBoss Developer Studio from the Red Hat Customer Portal. Follow the setup and installation instructions in the Red Hat JBoss Developer Studio documentation. Install the Red Hat JBoss Developer Studio plug-ins, as described in the next section. Because of an issue in the way multi-byte rule names are handled, you must ensure that the instance of Red Hat JBoss Developer Studio is started with the file encoding set to UTF-8. You can do this by editing the $JBDS_HOME/studio/devstudio.ini file and adding the following property: "-Dfile.encoding=UTF-8". Red Hat JBoss Developer Studio provides plug-ins with tools and interfaces for Red Hat Decision Manager. These plug-ins are based on the community version of these products. For this reason, the Red Hat Decision Manager plug-in is called the Drools plug-in. Get the latest Red Hat JBoss Developer Studio from the Red Hat Customer Portal. The Red Hat Decision Manager plug-ins for Red Hat JBoss Developer Studio are available using the update site. Start Red Hat JBoss Developer Studio. Click Add to enter the Add Repository menu. Provide a name next to the Name field and add the following URL in the Location field: https://devstudio.jboss.com/11/stable/updates/integration-stack/. Select the JBoss Business Process and Rule Development feature from the available options, click Next, and then click Next again. Read the license and accept it by selecting the appropriate radio button, and click Finish. Restart Red Hat JBoss Developer Studio after the installation process finishes. You can configure Red Hat JBoss Developer Studio to run the Red Hat Decision Manager server. To open the Drools view, click Window → Open Perspective → Other, select Drools, select specific views, and click OK.
Click Window → Show View → Other…​ and select Server → Servers to add the server view. Right click the Servers panel and select New → Server to open the server menu. Click JBoss Enterprise Middleware → JBoss Enterprise Application Platform 7.1+ and click Next to define the server. Set the home directory by clicking the Browse button. Navigate to theRed Hat JBoss EAP directory where Red Hat Decision Manager is installed. To configure the Red Hat Decision Manager server, select the Red Hat JBoss EAP directory where Red Hat Decision Manager is installed. Provide a name for the server in the Name field, ensure that the configuration file is set, and click Finish. You can configure Red Hat JBoss Developer Studio to connect to a central Git asset repository. The repository stores rules, models, functions, and processes. You can either clone a remote Git repository or import a local Git repository. You can clone a git repository to use with Red Hat JBoss Developer Studio. In Red Hat JBoss Developer Studio, select the server from the Server tab and click the start icon to start your server. In Red Hat JBoss Developer Studio , select File → Import…​ and navigate to the Git folder. Open the Git folder to select Projects from Git and click Next. Enter the details of the Git repository in the next window and click Next. Select the branch you wish to import in the following window and click Next. To define the local storage for this project, enter (or select) a non-empty directory, make any configuration changes and click Next. You can import a local git repository to use with Red Hat JBoss Developer Studio. Select your server from the Server tab and click the start icon to start the server. In Red Hat JBoss Developer Studio, select File → Import…​ and navigate to the Git folder. Open the Git folder to select Projects from Git and click Next. Select the repository source as Existing local repository and click Next. In the dialog window that opens, select the Import as general project radio button from the Wizard for project import group and click Next. This section is specifically intended for Decision Central development environments where you want to cluster the Git repository. It is not necessary to create a clustered environment for Decision Server production environments. Red Hat recommends that you consider clustering two or more computers to create a high availability clustered environment for design-time development environments. Doing this enhances collaboration and provides high availability. For example, if clustering is configured and Developer X is authoring rules on Decision Central Node1 then Developer Y, who is working on Decision Central Node2, can see the rules authored by Developer X as they are created. Furthermore, all of the developers working on individual nodes of the cluster will see the same synchronized content. In addition, clustering provides high availability in the rules development environment. If Developer X is working on Node1 and that node fails, Developer X’s work is preserved and visible on any other node of the cluster. The following sections describe how to create a clustered Red Hat Decision Manager environment. Elasticsearch is a highly scalable open source full-text search and analytics engine. It enables you to store, search, and analyze high volumes of data quickly and in near real time. In a Red Hat Decision Manager clustered environment, it enables you to perform complex and efficient searches across nodes. Set up Elasticsearch on the main node of the cluster. Download and unzip the Elasticsearch installation file. After you install Elasticsearch, you must activate ActiveMQ JMS broker on the main node of the cluster. Add <socket-binding name="activemq" port="61616"/> to the socket-binding-group element. Add <remote-acceptor name="activemq-acceptor" socket-binding="activemq"/> in <server name="default"> of the messaging-activemq subsytem element. Complete the steps in Section 4.3, “Installing Decision Central on cluster nodes” on each node of the cluster. Complete the steps in this section to install and run Decision Central on each node of the cluster. Install Decision Central on each node of the cluster. See Chapter 2, Installing Red Hat Decision Manager for information about installing Decision Central. After you have installed Red Hat Decision Manager, create an asset to verify that the installation is working. Enter the admin user credentials that you created during installation. The Decision Central home page appears. Select Menu → Design → Projects. Click mortages. The Assets window appears. Enter MyDataObject in the Name field and click OK.
Click Spaces → myteam → mortgages and confirm that MyDataObject is in the list of assets. If you are verifying a clustered installation, enter the following URL, where <node_IP_address> is the address of different node. Enter same credentials that you used with the Decision Central where you created the MyDataObject asset. Select Menu→ Design → Projects. Verify that MyDataObject is in the asset list. You can customize the Decision Central login page to meet your specific business needs. This includes the company logo and the project logo. Start Red Hat JBoss EAP and open Decision Central in a web browser. Navigate to the EAP_HOME/standalone/deployments/decision-central.war/img/ directory in your Red Hat Decision Manager installation. To change the company logo that appears at the upper right hand corner of the login page, replace the default image login-screen-logo.png with a new image in the PNG format. To change the project logo that appears above the User name and Password fields, replace the default image RHDM_Logo.svg with a new SVG file. Force a full reload of the login page, bypassing the cache, to view the changes. For example, in most Linux and Windows web browsers, press btn:[Ctrl]+btn:[F5]. You can customize the Decision Central application header to meet your specific business needs. Start Red Hat JBoss EAP, open Decision Central in a web browser, and log in with your user credentials. Copy your new application header image in the SVG format to the EAP_HOME/standalone/deployments/decision-central.war/banner/ directory in your Red Hat Decision Manager installation. Open the EAP_HOME/standalone/deployments/decision-central.war/banner/banner.html file in a text editor. Red Hat Single Sign-On (RH-SSO) is a single sign-on solution that you can use to secure your browser applications with your REST web services and Git access. This chapter describes how you can integrate RH-SSO with Red Hat Decision Manager and leverage its features. Integrating with RH-SSO brings an integrated SSO and identity management (IDM) environment for Red Hat Decision Manager. The session management feature of RH-SSO enables you to use different Red Hat Decision Manager environments on the web by authenticating only once. For more information on RH-SSO, see the RH-SSO documentation. Authenticating Red Hat Decision Manager Red Hat Decision Manager through RH-SSO involves securing both Red Hat Decision Manager web client and remote services through RH-SSO. This integration enables you to connect to Red Hat Decision Manager using either the web interface or a remote service consumer through RH-SSO. Authenticating Red Hat Decision Manager Decision Server through RH-SSO involves securing the remote services provided by Decision Server because it does not provide a web interface for server authentication. This enables any remote Red Hat Decision Manager service consumer (user or a service) to authenticate through RH-SSO. Authenticating a third-party client through an RH-SSO server requires third-party clients to authenticate themselves using RH-SSO to consume the remote service endpoints provided by Red Hat Decision Manager and Decision Server, such as the REST API or remote file system services. Set up and run an RH-SSO server with a realm client for Red Hat Decision Manager. Install and set up the RH-SSO client adapter for Red Hat JBoss EAP. Secure Red Hat Decision Manager remote service using RH-SSO. Security realms are used to restrict access for different application resources. You should create a new realm whether your RH-SSO instance is private or shared with other products. You can keep the master realm as a place for super administrators to create and manage the realms in your system. If you are integrating with an RH-SSO instance that is shared with other product installations to achieve single sign-on with those applications, all of those applications must use the same realm. Download RH-SSO from the Downloads section of the Red Hat Customer Portal. Install and configure a basic RH-SSO standalone server. To do this, follow the instructions in the "Install and Boot" chapter of the Red Hat Single Sign On Getting Started Guide. For production environment settings, consult the Red Hat Single Sign On Server Administration Guide. At this point, the RH-SSO server is configured with a realm with a client for Red Hat Decision Manager applications and running and listening for HTTP connections at localhost:8180. This realm provides different users, roles, and sessions for Red Hat Decision Manager applications. To set up the RH-SSO client adapter for Red Hat JBoss EAP, install the RH-SSO adapter for Red Hat JBoss EAP then configure Red Hat Decision Manager application and the RH-SSO client adapter. Install Red Hat JBoss EAP 6.4.X or 7.0. For version 6, see chapter Installation Instructions from the Red Hat JBoss Enterprise Application Platform Installation Guide. For version 7, see chapter Installing Red Hat JBoss EAP from the Red Hat JBoss Enterprise Application Platform Installation Guide. Install Red Hat Decision Manager in the freshly installed Red Hat JBoss EAP home. If you configure the RH-SSO adapter by making changes to the standalone.xml file, and then unzip Red Hat Decision Manager, you may overwrite and lose the RH-SSO adapter configuration. Download the Red Hat JBoss EAP adapter from the Red Hat Customer Portal. Unzip and install the adapter. For installation instructions, see the JBoss EAP Adapter section of the Red Hat Single Sign On Securing Applications and Services Guide. For version 7, go to EAP_HOME/standalone/configuration and open the standalone.xml and standalone-full.xml files. Delete the <single-sign-on/> element from both of the files. You do not need to perform this step for Red Hat JBoss EAP 6. The RH-SSO server converts the user names to lowe rcase. Therefore, after integration with RH-SSO, your user name will appear in lowe rcase in Red Hat Decision Manager. If you have user names in upper case hard coded in business processes, the application may not be able to identify the upper case user. You can also configure the RH-SSO adapter for Red Hat JBoss EAP by updating your application’s WAR file to use the RH-SSO security subsystem. However, Red Hat recommends that you configure the adapter through the RH-SSO subsystem. Doing this updates the Red Hat JBoss EAP configuration instead of applying the configuration on each WAR file. Log in to the RH-SSO Admin Console and open the realm to which you wish to add a user. Click the Users menu item under the Manage section. An empty user list page called Users opens. Click the Add User button on the empty user list to start creating your new user. The Add user page opens. Provide user information on the Add user page and click Save. Set a new password under the Credentials tab. Assign the new user one of the roles that allow access to Red Hat Decision Manager. For example, the admin or analyst role. Define the roles as realm roles in the Realm Roles tab under the Roles section. Click Role Mappings tab on the Users page to assign roles. You can now log in to Decision Central after you start Decision Server. Red Hat Decision Manager provides different remote service endpoints that can be consumed by third-party clients using remote API. To authenticate those services through RH-SSO, you must disable a security filter called BasicAuthSecurityFilter. To consume other remote services, such as file systems (for example, a remote GIT service), you must specify a correct RH-SSO login module. First, generate a JSON configuration file. Navigate to the RH-SSO Admin Console located at http://localhost:8080/auth/admin. For more information, see the JAAS plugin chapter of the Keycloak Securing Applications and Services Guide. This section describes how you can use Decision Central to manage users and groups stored in RH-SSO. The Red Hat Decision Manager Decision Server provides a REST API for third-party clients. You can integrate Decision Server with RH-SSO to delegate the third-party clients identity management to the RH-SSO server. After you have created a realm client for Red Hat Decision Manager and set up the RH-SSO client adapter for Red Hat JBoss EAP, you can repeat the same steps to integrate Decision Server with RH-SSO. 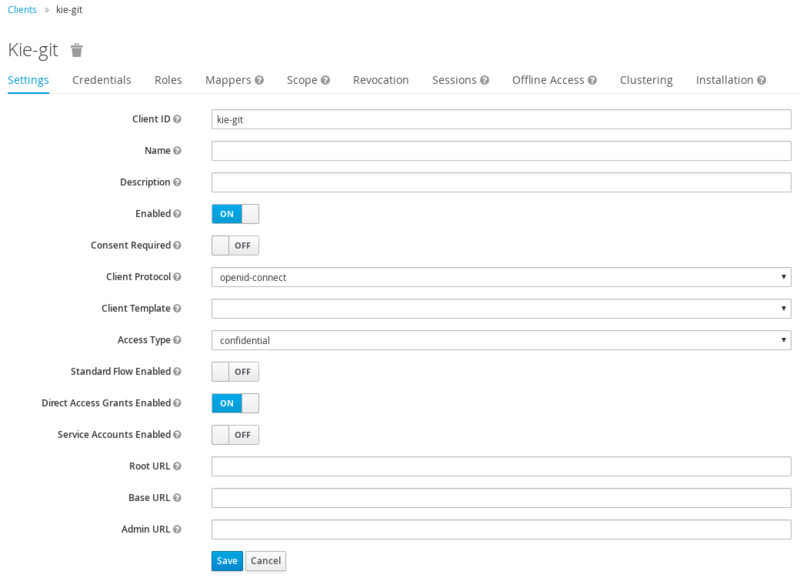 You can use the RH-SSO Admin Console to create a new client in an exiting realm. In the RH-SSO Admin Console, open the security realm that you created. Navigate to the Credentials tab and copy the secret key. The secret key is necessary to configure the kie-execution-server client in the next section. To consume the Decision Server remote service endpoints, you must first create and assign the kie-server role in the RH-SSO Admin Console. If you deployed Decision Server to a different application server than Red Hat Decision Manager, install and configure RH-SSO on your second server as well. Save your configuration changes in the standalone.xml file. You can also use token-based authorization for communication between Red Hat Decision Manager and Decision Server. You can use the complete token as a system property of your application server, instead of the user name and password, for your applications. However, you must ensure that the token will not expire while the applications are interacting because the token is not automatically refreshed. To get the token, see Section 7.3.2, “Token-based authentication”. To configure Red Hat Decision Manager to manage Decision Server using the tokens set the org.kie.server.token property. Make sure that the org.kie.server.user and org.kie.server.pwd properties are not set. Red Hat Decision Manager will then use the Authorization: Bearer $TOKEN authentication method. If you want to use the REST API using the token-based authentication, set the org.kie.server.controller.token property. rest-all for using Red Hat Decision Manager remote services. kie-server for using the Decision Server remote services. Use the RH-SSO Admin Console to create these roles and assign them to the users that will consume the remote services. Basic authentication, if it is supported by the client. If you want to opt for a more secure option of authentication, you can consume the remote services from both Red Hat Decision Manager and Decision Server using a granted token provided by RH-SSO. In the RH-SSO Admin Console, click the Clients menu item and click Create to create a new client. Change the value for Access Token Lifespan to 15 minutes. This gives you enough time to get a token and invoke the service before it expires. The user used in the command above is an RH-SSO user. For further information, see Section 7.1.3, “Adding a new user”. With Red Hat Decision Manager you can integrate LDAP and SSL through RH-SSO. For information about configuring LDAP and SSL with RH-SSO, see the Red Hat Single Sign-On Server Administration Guide.